Today’s post (the third post in the Mass Ave rejuvenation series) focuses on a block many see as the vital, key component to connect the north and south ends of Mass, which for so many years felt disjointed due to a pedestrian-unfriendly Firefighter complex and a hole in retail continuance walking north. Note the red dotted line on Michigan. South of the line on Massachusetts lay active retail components – however, for years a quick walk north of the line found a disengaging dead zone. Let’s take a prompt glimpse at two developments ensuring to resurrect this “dead zone”. 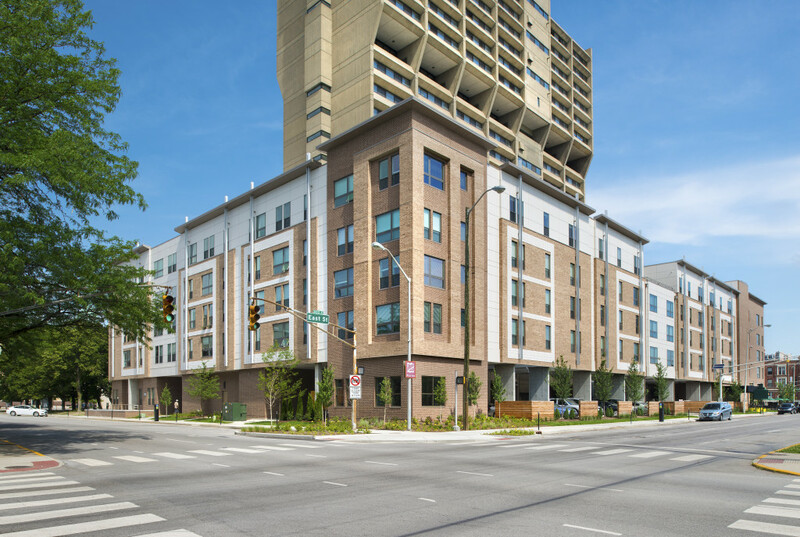 Millikan on Mass: Intended for completion in two phases (that methodology presently seems ubiquitous in urban development), the first phase, which is seen here, opened in December 2013 and includes 61 apartment units that offer reduced rents for low-income residents, as well as 4,000 square feet of retail space on the first floor. The retail space on Mass/East is already occupied by Nine Irish Brothers, a Lafayette-based restaurant/bar. A second phase will include 64 market-rate units and 15,000-square feet of retail space -from my sources the apartments are finished currently and the commercial spaces should be finished in time for spring openings. While it does engage the street, Millikan leaves you wishing for more. What is Millikan aiming for? Postmodernist, quasi-historic that failed out of art school? You can’t be everything at once, but at least align with your context. This juxtaposition is a prime example of what is wrong with modern architecture. pure architectural statement by surrounding it with a spurious historic/neo-traditional wrap is almost despicable. However, at the end of the day this project augments Mass Ave’s connectivity, mixed-uses, and neighborhood structure -all which make Millikan a net gain for the city. 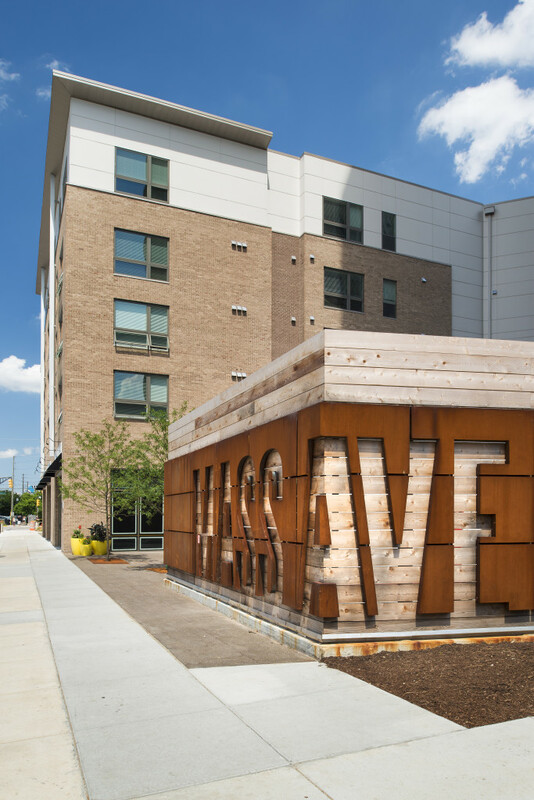 Montage on Mass – One of my favorite approved projects in Indianapolis, Montage is a mixed-use, 5 floor development slated for completion in 2018 on the former site of Fire HQ. Following a complicated land swap involving the Firefighters Credit Union, a fire station and the Red Cross, work was finally approved in November 2015 with the only hindrance a proposed LED-board (submitted as a huge digital canvas featuring local artists) facing the Mass/New Jersey intersection -that proposal is currently awaiting litigation decisions on Indy’s digital sign ordinance (assuming it withstands local NIMBYism). Digital board or not, the proposal in terms of the structure itself stands to be a remarkable one for the city. Offering over 37,000 sq ft (!!!!) of retail space, a more than 25% increase of Mass Ave’s commercial space currently, Montage will assist immensely in fortifying the Massachusetts street wall and stands to be the last step in negating the pedestrian “dead zone” previously mentioned. Personally, I adore the rounded corner retail activation (a stark contrast to opposing Millikan with its sharp jut into the Michigan/Mass interface) and its open, engaging storefront windows. There has been much clamor over the use of facade color in the previous design but the updated proposal seems to have implemented a more urban aesthetic with its brick/blue segments and glass interruptions. As for the digital LED board (if given approval), I think it adds to Mass Ave’s implied street activity and suddenly makes the intersection combining the Murat and Athenaeum one of the most vibrant and engaging places in the city. As always, feel free to add your thoughts in the comments! Tomorrow, we will be continuing our series on Mass Ave with an piece on the block between North/East and Park/Walnut. Wow… we disagree on quite a bit. Personally I like millikin on mass, i agree that it’s generic but not offensively so, I don’t understand how you can hate millikan for being generic yet love montage, montage is an unrefined generic and juvenile version of millikan. And that digital “canvas” is going to turn itself into billboard the first chance it gets, do you really think the developers would fight so hard if it was just for “art”… no. I don’t hate montage but it’s a bit cheap, tacky and desperate looking attempt. the corner is fine but the elevations need more development. It’s just a half assed attempt at not being one monolithic building. But I suppose it brings far more positives to the table than negatives, that firestation has to go, it IS absolutely a dead zone.